Ken Unsworth is one of Australia’s leading sculptors. In 1989 he was awarded an Australian Creative Fellowship and the Order of Australia for service to sculpture. In 1998 he had a major retrospective at the Art Gallery of NSW. Volykhine was born in Russia in 1967 and raised there. He has a degree in Mining Engineering. He has been painting since 1991 when he left Russia and went to the USA. He exhibited at The Painting Centre and Academy Arts in New York City and then at the Makawao Arts and Cultural Center in Maui. Volykhine has lived in Sydney since 2000. He has had solo exhibitions at 1 + 2 Artist Studios in Sydney in 2001 and at groundfloorgallery in 2002. 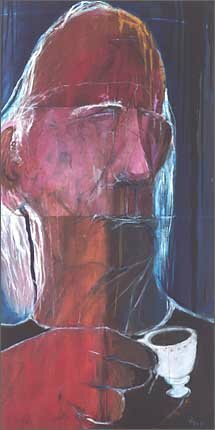 He also showed work at Wadi Gallery in Sydney in 2000.